Winter squash and lentil soup is my favourite. When I first made this soup I searched for the perfect recipe but none of them worked for me. So I made one of my own. No crazy curry powders, no unhealthy heavy creams and definitely no sugar, just good taste of fresh vegetables. I made this soup many times before but I was never quite happy with it until I added lentils. They make a huge difference. Taste wise, they add earthy notes to the slightly sweet taste of squash. 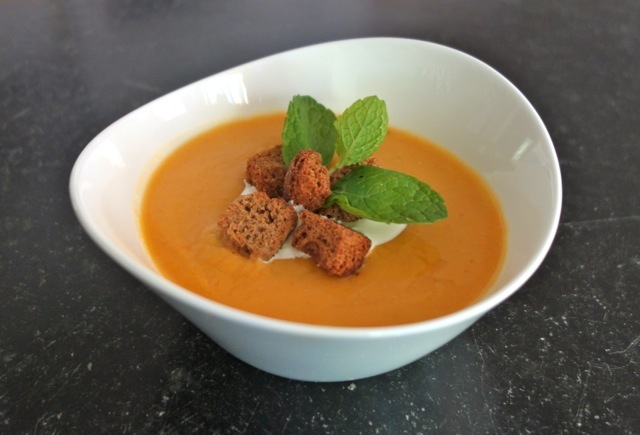 Nutritionally, they add a source of protein making the whole soup, including the croutons, into a complete meal. You may be avoiding carbs to be healthy or to lose a few pounds but in this recipe croutons are critical. They will give you an energy kick to keep you going until your next meal and they complement the lentils with two additional amino acids giving your body all the parts of protein to function well and to build muscle. So don’t be scared, put the croutons on and enjoy this delicious soup. 1) Prepare your ingredients. Chop the onion into small pieces. Cut the celery into half a centimeter slices. Chop the carrot and apple into small cubes. Peel and dice the winter squash. 2) In a 4-quart Dutch oven combine the oil and onion. Cook stirring over medium heat until the onion starts to brown. 3) Add the celery and carrot. Cook about 10 minutes until both celery and carrots start to soften and caramelize. 4) Add the squash, apple and chicken broth and bring to boil. Simmer gently until the squash is soft for about 20 – 25 minutes. 5) In the meantime rinse the red lentils. In a separate 2-quart pan combine the lentils with 4 cups of hot water. Simmer gently with the pan partially covered until desired softness is reached, about 15 minutes. 6) Add the cooked lentils to the cooked winter squash soup. Puree in a food processor until silky smooth. 7) Return the soup to the pan and season to taste with salt, pepper and nutmeg. The soup should have the right consistency. If the soup is too thick then add a little bit of chicken broth to thin it out. If it is too watery then simmer it a little bit further until the soup thickens. 8) To serve add a little bit of crème fraiche, croutons and a few mint leaves to each bowl. If you are trying to be super healthy you can use plain Greek yogurt instead of crème fraiche.